POSSIBLY you have never been tempted to wonder how the letter that lies on your breakfast table in the morning has pursued its journey. Or you, on your part, may have written a letter overnight, addressed it to some distant destination, and put it in the post, with never a thought as to how it is going to get there. So it may be that a trip on the famous “West Coast Postal” will awaken a new interest in the travels of your correspondence, conducted with a regularity and a certainty that in themselves are sufficient to explain the small thought that you ever give to the matter. Without the travelling post offices that now traverse the country in all directions it probably would be impossible to cope properly with the nation’s correspondence. Obviously every town or village could not make up a mailbag for every other town or village to which it might desire to send letters or parcels, perhaps only in two’s or three’s. If this were done the service would breakdown “from sheer weight of canvas”, as one writer has picturesquely put it. Neither does the use of large centres for sorting and distribution altogether meet the case, as there is much postal traffic that is too small to justify a direct delivery from town to town. This is where the travelling post office comes in. By collecting up and sorting the batches of letters received at various points during its journey it is able to add together the “driblets” for each particular place until they amount to a respectable total. Years ago the postal trains, or the “mails”, as they were called, were the fastest and most important trains in the country. Passengers were conveyed by them, but often only first-class, or first and second-class travellers, and extra fares were charged for the privilege of using the trains. To-day the postal business has grown to such enormous dimensions that on the chief postal trains the ordinary passenger is neither wanted nor allowed to travel. These trains run exclusively at night, and while they are no longer the fastest expresses in the country - high speed through the night hours being unnecessary in order to ensure delivery of the letters with the morning’s post - every attention is concentrated on the maintenance of absolute punctuality. Most famous, as well as most historic, of all the British postal trains is undoubtedly the “West Coast Postal”, which for many years past has left Euston terminus for Scotland, by the LMS route, at half-past eight in the evening. Practically the whole of the mails from London and the South and West of England to Scotland are carried by this train, so that its importance may be readily understood. 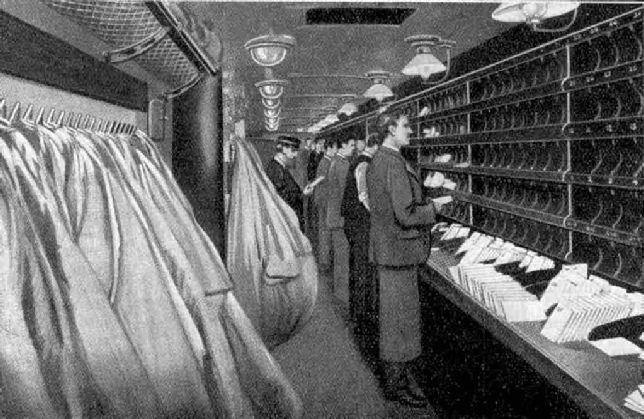 We are now to imagine that we have secured the jealously-guarded privilege of accompanying the train as passengers, in order that we may see the postal staff at work. The driver, fireman and guard are the only railwaymen on the train, whereas the postal officials number about thirty all told. Arriving at Euston in imagination at eight o’clock in the evening, we find that the postal staff has been at work for a good hour before us. Drawn up at No. 2 platform, which is paralleled by a wide carriage-way, we see a train of about a dozen vehicles. They include ordinary brake-vans, Post Office letter and parcel sorting carriages and “tenders” for stowage, all vestibuled together. Red “Royal Mail” vans of all descriptions are constantly arriving by road from all parts of London, and their contents are being bundled into the different coaches, which are distinguished outside by large and prominent capital letters, according to their destinations. While this is being done, we may have a look at the locomotive. LMS 4-cylinder 4-6-0 Locomotive No. 5969, “Claughton” Class. “Sir Gilbert Claughton” in 1913, immediately followed the similar loan of the GWR “Polar Star” in the previous year. Little need be said about the “Claughton”; they are simple and straightforward design, which has given excellent service in its time, but now needs to be supplemented by something rather more powerful for the maximum duties of the West Coast Route. It is an engine of the “Claughton” class, by the way, that has been fitted with the Italian “Caprotti” valve motion, and was recently under test between Euston, Crewe and Carlisle, as mentioned in various newspapers. which to make our inspection of the train, being careful not to get in the way of the hard-worked “crew”. There is a bad start out of Euston, the first 1¼ miles to Camden, practically off the platform end, being inclined upwards at between 1 in 70 and 1 in 105. So steep is this bank, indeed, that the engineers of the London and Birmingham Railway never imagined that locomotives would climb it under their own steam, and consequently installed a winding-engine at Camden to haul the trains by rope up the bank, the locomotive to take them on their journey being attached at the summit. Such undignified methods have, of course, been done away with long since, but it is quite possible that the engine that brought in our empty coaches may assist by giving us a friendly push in rear up to the top. After that there are few grades worthy of mention for the next 180 miles or so; in fact the “ruling”, or maximum grade, does not exceed the modest figure of 1 in 330 for some 150 miles continuously. Roughly the line is level from Camden to beyond Willesden; rises from there to Tring, 31¾ miles out, where the Chiltern Hills are crossed at an altitude almost exactly level with the top of St. Paul’s Cathedral; drops to Bletchley and Wolverton; rises to Kilsby Tunnel, and falls to Rugby. Having noted that our engine has got well and truly under way, and as, perhaps, the lights of Willesden Junction flash by, ten minutes after the start, our speed now closely approaching the mile-a-minute rate, we gravitate to that hive of industry - or rather one of them - a letter-sorting carriage. 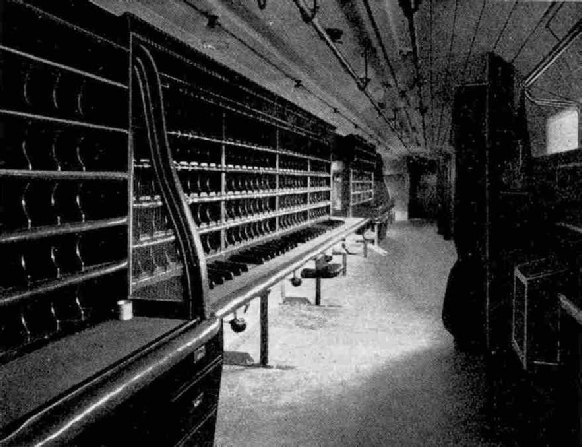 All down one side of the long open vehicle are nests of pigeon-holes for the letters and racks for the parcels, into which the packets are disappearing from the hands of the row of sorters with lightning rapidity. The average rate of sorting per man Is somewhere about 40 to 50 letters a minute, but it may vary from 30 to as many as 70, according to the worker’s mental and physical condition. Tremendous mental concentration is necessary, especially as the pigeon-holes are not named, but only numbered, and the meaning of each number is constantly changing, according as fresh sets of towns require to be prepared for on successive stages of the journey. Needless to say, in the construction of these vehicles special attention is paid to the springing, in order that they may ride as smoothly as possible. Another very necessary precaution is the padding of the ends of the coaches, as well as all projecting angles and corners inside, in case any of the sorters should lose his balance owing to the rocking of the train. Efficient light-ing, too, is a matter of supreme importance. The interior of the sorting-carriage is the very embodiment of the proverb “a place for everything and everything in its place”, and, feeling as we do that it is certainly no place for us, we move on into the coach in which the receiving and delivering apparatus is worked. By now we have climbed up to Tring, probably sustaining a speed of round about 50 mph all the way up the long 1 in 330 ascent, the first 31¾ miles having been covered in 41 minutes. Water has been taken from the troughs at Bushey, 15 miles out of Euston, and the first consignments of letters already have been picked up at various points. All the time that we were watching the sorters, the bags for delivery were getting gradually filled and sealed up - as the overpowering smell of melting wax forbade us to forget - and were being hung up on hooks behind the sorters, in their proper order, ready to be taken to the apparatus. This again is a job requiring no small care and attention, as there are some 400 different bags in use. Meanwhile, what time we are devouring space at the rate of a mile a minute or more - between Tring and Bletchley we shall probably cross the “seventy” line - a small army of postmen are converging on the railway from various villages and towns, in motors, on bicycles and on foot, in order to exchange the mails with us as we flash by. Their objectives are the fixed sets of mail apparatus that are arranged along the lineside near the various stations where exchanges are made. At each of these points there is a large opening net, made of some of the stoutest rope obtainable, for catching the bags off the train, and also a tall standard on which the postman’s bags are hung, in order to be swept into the train. A small hut is erected adjacent to the apparatus, and in this the postman waits until a bell-signal from the nearest signal-box, which he acknowledges, warns him that the “Postal” is approaching. While waiting, he has been fastening his bags up in stout leather pouches, as no canvas bags would stand the tremendous buffetting that occurs when the exchange is made. On hearing our approach signalled, the postman mounts the steps of the standard and suspends his pouches from it. The pouches hang from a heavy leather thong, an eyeletted hole in which fits over a pin on the end of the standard arm, while a spring catch further secures the pouches from jolting off before the time. This done, a second bell-signal in the hut warns him to swing the pouches out towards the line in readiness. Meanwhile the man to whom is entrusted the corresponding job on the train has not been idle, and his is by far the more ticklish job of the two, as he has to be familiar with every place at which an exchange is made and to be ready for it. White warning boards are fixed beside the line to indicate the proximity of the ground apparatus. These are of little use at night, however, and the officer on duty has to rely mainly on his sense of hearing, which constant familiarity with the route has sharpened to an abnormal degree. As we watch, we notice him open the sliding door at the side of the van and draw in the extending arms, in order that he may hang on them the bags now destined for delivery, enclosed, of course, in leather pouches. These are then swung right outwards, the big folding net on the side of the sorting coach is opened, and an automatic bell begins to ring, announcing the imminence of the exchange. 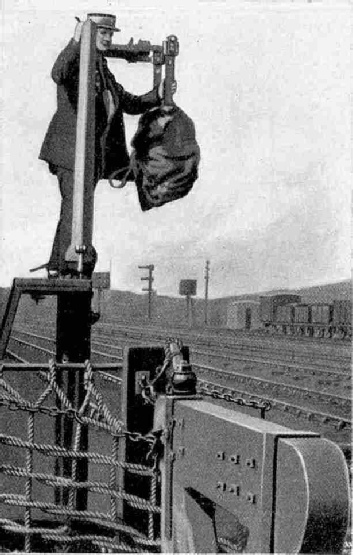 Postman fixing a pouch in position to be picked up by the mail train. A few moments’ suspense, and then - biff!! Two poaches, detached from the ground standard by a strong leather-bound “V”-rope stretched across the mouth of the carriage net, come hurtling in through the doorway and rebound from the opposite wall. A similar contrivance on the ground net has neatly “collared” our bags at the same moment, the exchange probably having been completed while we are travelling at well over 60 miles an hour. At Bletchley, which we have now passed, the important connections from Oxford, Cambridge, Bedford and other towns result in some twenty bags or so flying in at once, a whole row of ground standards and a special Post Office on the station platform having been installed there to deal with them. Each fresh arrival of the bags is, of course, opened at once, and the contents are in the hands of the sorters in next-to-no-time, so that the work of sorting goes on practically without cessation. We are now threading Kilsby Tunnel - a name of sinister associations to the builders of the old London and Birmingham Railway, whose estimate of £99,000 for its construction was actually swollen to £300,000 before completion owing to the tapping by the bore of a gigantic underground quicksand, which flooded out the workings with millions of gallons of water. Five minutes later we run into Rugby, having covered the 82½ miles from Euston in 95 minutes. Had it been light, we should have been thrilled, as we approached Rugby, by the sight of a forest of 800 ft steel masts of the vast Government wireless station at Rugby, immediately on the east of the line. The masts of Daventry, whose name is so familiar, also can be seen quite clearly, on the west of the line, between Weedon and Kilsby Tunnel. At Rugby a brief three, minute suffice to collect the Eastern Counties mail, and at 10.8 p.m. We are off again, the next booked stop being at Tamworth, 110½ miles from Euston. The gradients are still easy, and probably we shall touch 70 mph, or slightly over, as we dash through Nuneaton. Heavy mail business is transacted at Tamworth, a special train from Lincoln having brought to the high level station many bags from Nottingham, Derby and the Midlands generally. To transfer this on to the “Postal”, at the low level, needs 7 minutes. At 10.47 p.m. we are off again on our journey to Crewe. During this run, of 57 minutes’ duration, we seize the opportunity of taking a peep into one of the parcel vans. Here the spectator is decidedly de trop; there is scarcely room, indeed, in which to turn round. The open coach is full of postal baskets of all kinds, and their contents are being rapidly thrown from hand to hand amid a babel of shouted destinations, until they reach their proper receptacle. “Parcel Post” takes on a new meaning as we view the animated scene. At 11.44 p.m., After rattling over points and crossings innumerable, we run into the big junction at Crewe, where an allowance of 13 minutes is none too long in which to do a tremendous amount of work. Bags and baskets pour in from Birmingham and the Black Country, the uttermost limits of the West of England, South and North Wales. Matter for Ireland is transferred into the “Irish Mail”, which left Euston 15 minutes behind us. During this time our train is “examined”, and the engine that brought us over the 158 miles from Euston to Crewe is exchanged for another to take us over the 141 miles on to the Border town of Carlisle. Quite likely our new steed will be one of the large 4-cylinder 4-6-0 engines of the Lancashire and Yorkshire Harwich design. From Crewe northwards the start to Warrington is mostly on falling gradients and we get away rapidly, but between there and Preston, as we thread the Lancashire colliery area, some rather steeper grades are encountered, notably the 1 in 105 out of Wigan, known as Boar’s Head bank. An hour’s run, however, suffices to bring us into Preston, 51 miles further on, at 12.57 a.m., where a further heavy mail from Liverpool, Manchester and the thriving towns of East Lancashire is taken on board, in exchange for sorted mails destined for E. and N. Lancashire. The most difficult part of the “Postal’s” journey, from the locomotive point of view, now lies ahead. For the first 27¼ miles out of Preston, past Lancaster to Carnforth, the line is practically level, but at the latter station the West Coast track, which has just skirted the shores of Morecambe Bay, practically at sea level, heads straight inland for the mountains of West-moreland. In the course of the next 31 miles we have to climb to an altitude of 915 ft above the sea, at Shap Summit. The hardest grades of the ascent are from Milnthorpe, through Oxenholme, to the wayside station of Grayrigg, 11 miles, and then six miles from just before Tebay to Shap. The former finishes with two miles at 1 in 106 and the latter with four miles at 1 in 75. Post Office Letter Van, sorters at work. Should the weather be bad, or the load over 350 tons, and should we not have taken a “pilot” or assisting engine from Preston, we may possibly stop at Tebay for assistance in rear up the steepest part of the climb. If our engine is running well, however, we probably shall tackle the ascent unaided, though we may expect the speed to fall to 20 miles an hour ere we breast the Summit signal-box. Just before Tebay, by the way, as we threaded the deep gorge that is one of the chief scenic attractions in the daytime, we took water from Dillicar troughs - the ninth and last set of troughs on the 299-mile journey from Euston to Carlisle. On three separate occasions in London and North Western history a world’s record has been created by the covering of this distance non-stop, with the aid of these troughs, but there is little likelihood of any such run being instituted as a regular practice, owing to the strain thereby entailed on both locomotive and crew. The recent talk of the newspapers as to running nonstop from Euston to Glasgow is, of course, sheer nonsense, and has no further foundation than the laying down of water-troughs, now proceeding, between Carlisle and Glasgow. To come back to our “West Coast Postal”, which is now flying down the 31-mile descent from Shap, we may expect our highest speed of the journey, if the driver be so minded, somewhere near Clifton, before the slight slowing that takes place through Penrith, or through Calthwaite or Southwaite, a little further on. Quite possibly a maximum speed of 75 to 80 miles an hour will be attained. At seven minutes to three in the morning - that indefinable period known as the “small hours” - we draw up in the Citadel Station at Carlisle, having covered the difficult 90 miles from Preston in the excellent time of 106 minutes. Our “Western Division’’ engine is here exchanged for one of the Caledonian section. At one time it would have been a sky-blue McIntosh or Pickersgill 4-4-0; to-day, as likely as not, we shall find a Midland 3-cylinder 4-4-0 compound, backing on. Numbers of these engines are now at work in Scotland, and to the credit of the Scottish drivers be it said that they are getting some of the best work out of them that is seen on any part of the LMS system. By this time we ought, by rights, to be too, and the probability is that the remainder of the journey will find us too drowsy to take much notice of what is going on. From Carlisle we head northwards into the mountains of the Scottish Lowlands. Leaving at 3.3 a.m., we are allowed only 44 minutes in which to cover the 39¾ miles to Beattock, although much of the distance is uphill at 1 in 200. The stop at Beattock is compulsory, in order that we may attach in rear one of the banking engines kept there perpetually in steam for the purpose of assisting trains up the 10 miles at between 1 in 69 and 1 in 88 up to Summit, which is at no less than 1,015 ft above the sea. After passing Beattock Summit all our difficulties are at an end. We enter the valley of the Clyde and follow it all the way down to Glasgow, crossing the river in all some six times. At Carstairs the “Postal” is divided. Arriving there at 4.32 a.m., the Aberdeen portion leaves at 4.36, and then, calling at Stirling and Perth, only reaches the “Granite City” eight minutes before 8 a.m. The rear portion is whisked away, with an engine on the other end, to Edinburgh, and the middle runs on down to Glasgow, coming to rest in the Central Station, 401½ miles from Euston, at 5.25 in the morning, in ample time to allow of the delivery on some Scottish breakfast table of the letter that you posted in London the evening before, after its adventurous journey on the “West Coast Postal”. You can read more on “Carrying the Mails”, and “Travelling Post Offices” on this website.